Dogs are in general the nature’s gift to human beings; they are obedient, truthful and show immense love for the owner. In recent times, there were many attempts to create new breeds of dogs. Many different breeds were created, with specific job functions in mind. 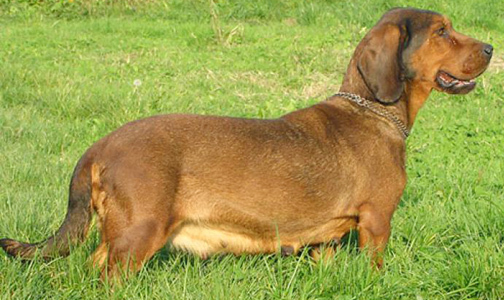 The Alpine Dachsbracke is one of the new breeds created with a specific purpose. 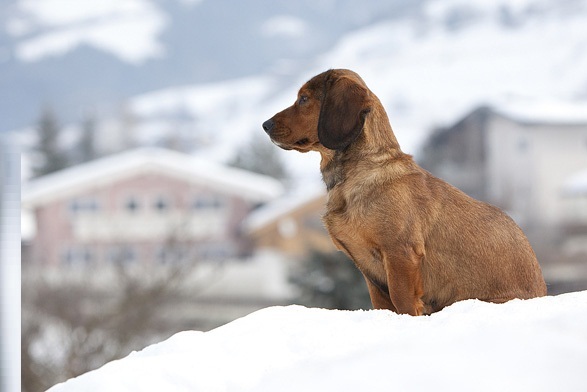 The Alpine Dachsbracke is a small breed of dog of the scent hound type originating in Austria. The Alpine Dachsbracke was bred to track wounded deer as well as boar, hare, and fox. 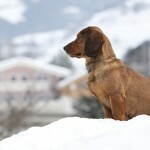 The specialty of Alpine Dachsbracke is it will detect the scent even after the trial has gone cold. The Alpine Dachsbracke is very sturdy dog. 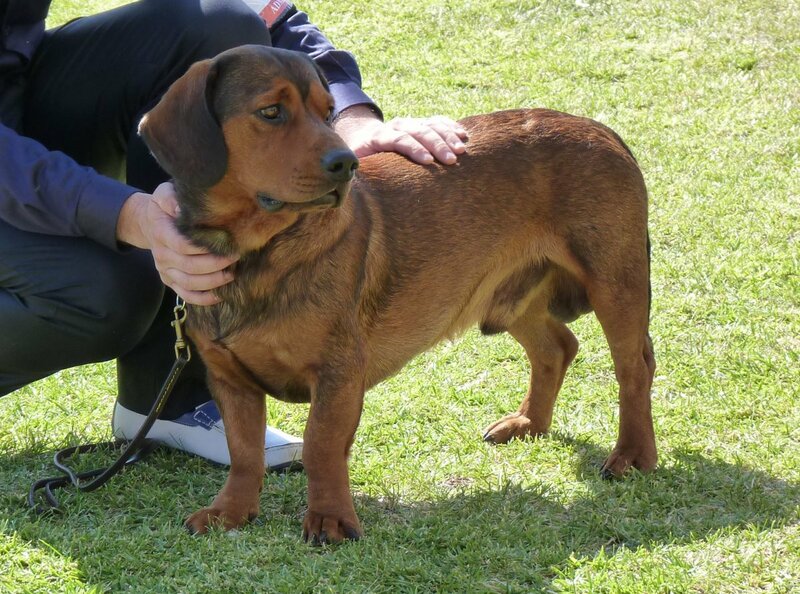 Alpine Dachsbracke is a favorite of royalty and used to accompany kinds during their hunting expedition to mountains. The life expectancy of Alipe Dachsbracke is around 12 years. No genetic dis orders have been reported with this breed. The Alpine Dachsbracke is a short-legged, sturdy hunting dog with a robust, strong boned body structure, dense coat and firm muscles. The bridge of the nose is straight and the skull is lightly arched. The nose is straight and is at top of the face, this facilitates the Alpine Dachsbracke to get the scent even in conditions of slight breeze. The color of nose is black; Alpine Dachsbracke has strong complete teeth which clamps with scissor or pincer bite. The neck portion is very robust with strong circular muscles. The tail is set on high, thick at root. 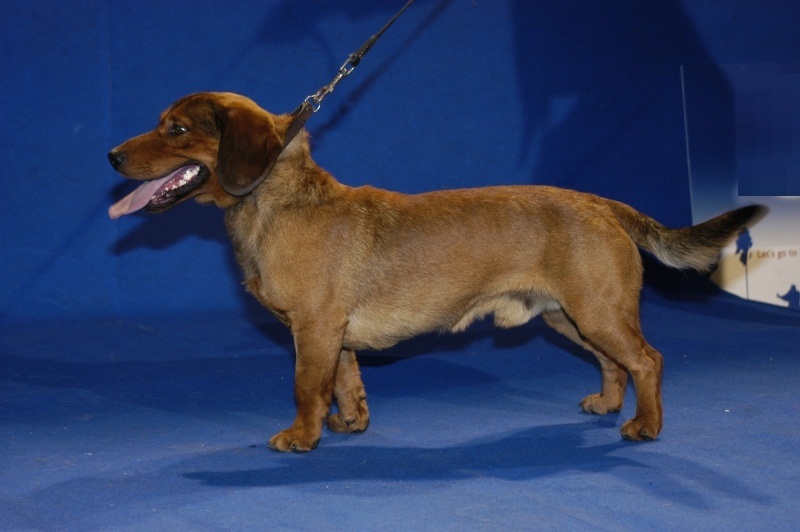 Alpine Dachsbracke has strong shoulder which are thickly muscles. 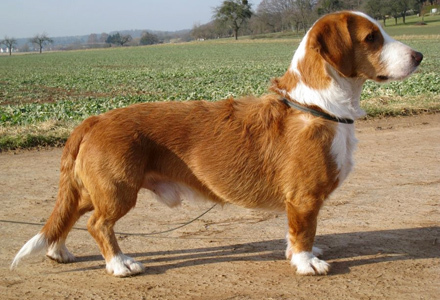 If you observe Alpine Dachsbracke from the rear the leg appears to be straight. 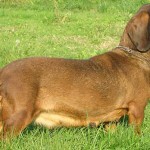 The Alpine Dachsbracke has a double coat consisting of very thick top coat and a dense undercoat, which covers the whole body and is close fitting. The color of dog usually is dark deer red with or without black hairs lightly interspersed. The breed usually carriesa white star on chest which distinguishes the dog from other close breed.Alpine Dachsbracke and Dachshund have few things in common. Both are different breed of dogs; both have small legs and long body. 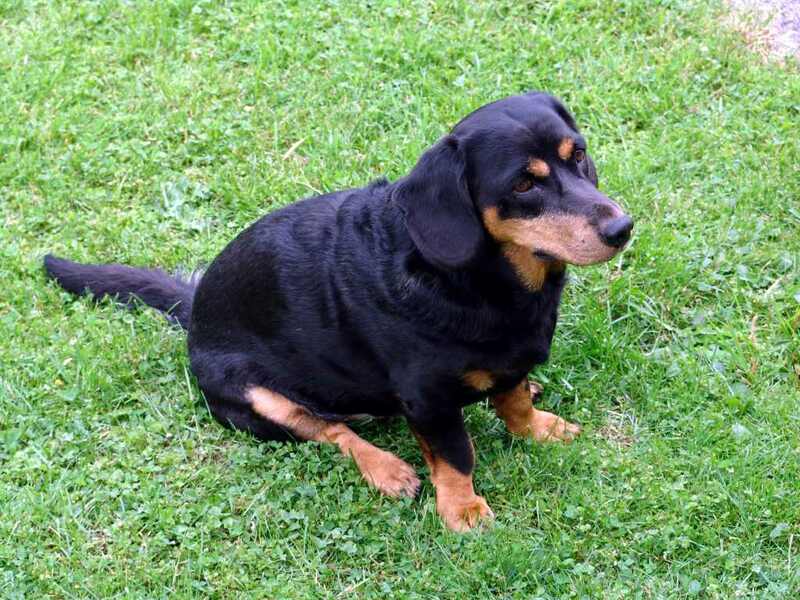 Compared to Dachshund the Alpine Dachsbracke is sturdier and has big boned structure. 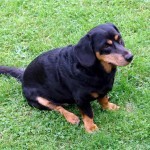 The Alpine Dachsbracke has a double coat consisting of very thick top coat and a dense undercoat, which covers the whole body and is close fitting. 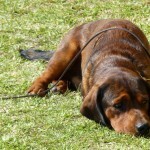 Alpine Dachsbracke has a good temperament, friendly with fearless personality. Mountain hunts men use this dog which is weather resistant working dog. 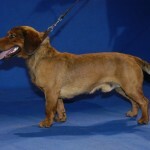 Usually Alpine Dachsbracke grows up to a height: 13 – 16.5 inches (34 – 42 cm) and weighs around 33 – 40 pounds (15 – 18 kg). They are now used as pets. Alpine Dachsbracke are friendly with children as well as with other animals. They need very good exercise regularly; the vigorous physical activity will make the dog more active. The short coat of Alpine Dachsbracke needs regular grooming. It can live in an apartment without special yard. Alpine Dachsbracke prefers food which is high in nutrition. There are many protein supplements available in the market. Pet nutritious supplements specific to different breed of cats and dogs are available. Choose the best available pet food; consult pet specialists and ensure that the dog is fed and exercised regularly. Alpine Dachsbracke is cross between larger Austrian hounds with smoother Dachshunds. The result is highly effective dog which catches scent even after the scent has gone cold. 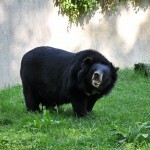 It has been bred by hunters since 19th century. Females give birth to litters averaging eight puppies, which are born blind. 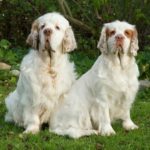 They look very cute and their eyes are round and big which is a likable feature..
Alpine Dachsbracke has a life span of 12 years. They are very friendly dog; they are basically hunting dog hence require lot of exercise. 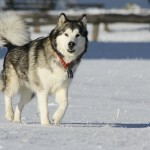 These dogs adopt very well to the vigorous task set by hunters. Those who require a companion and a household pet then Alpine Dachsbracke will easily satisfy the owner. 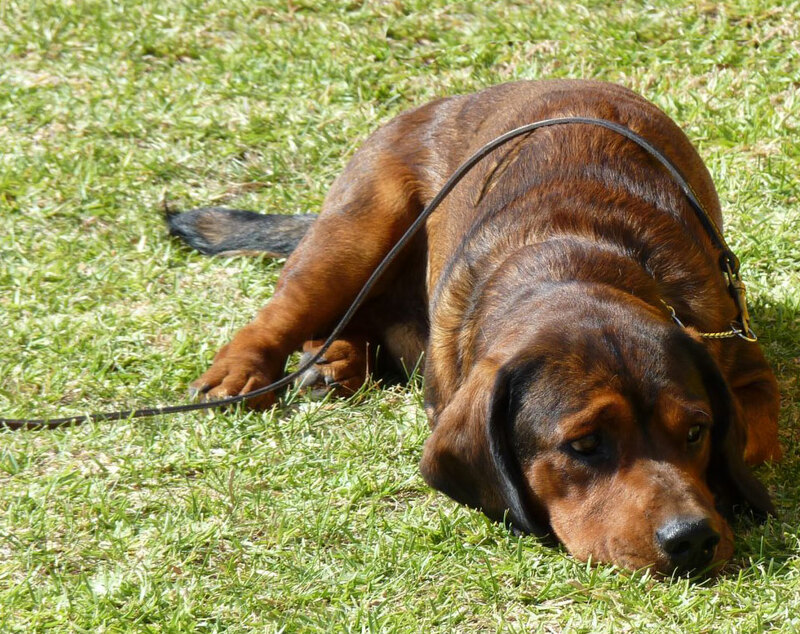 Alpine Dachsbracke is a breed that will need a moderate amount of exercise in order to burn off the energy that they have. A brisk walk daily should suffice and they should be expected to be rather active indoors, as well, playing and running about. They are quite friendly and loving dogs. Alpine Dachsbracke possess high level of intelligence hence they should have plenty of mental and physical stimulation to prevent boredom. If they are not kept busy enough, they will be prone to obsessive barking, destructiveness, and other undesirable behaviors. Does not it sound like they have the mentality of majority of humans?. They are quite intelligent; they will acquiesce to the wishes of the owner, as long as there is a good communication and understanding between the owner and the dog. Training should be regular; The trainer should establish his or her position as “pack leader” from the start. The dog responds well to firm, stable, and calm situation. 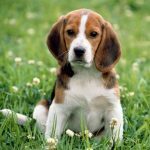 The dog respondsand learns quickly, especially regarding the natural hunting instincts that they have, and reciprocates positively upholding their position and the expectations in the family. In the year 1991, Alpine Dachsbracke was accepted for registry in the FCI under the “scent hound” category. Later, Alpine Dachsbracke is also granted permission to be under the registry of APRI, NKC, CKC, ACR, ACA, and DRA registries. Registry has its own importance; for an average owner, owning a dog is his or her personal passion; the importance of registering dog under various registries is, the dog value increases. Those who are engaged in the activities of breeding or training of the dog will get a good price. 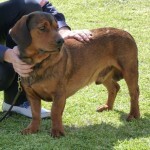 An interesting fact is, Alpine Dachsbracke is thought to be existing as early as 1881. Somewhere around that time, Crown prince Rudolf of Habsburg, always ordered his staff to bring Alpine Dachsbracke along with him during hunting trips. Alpine Dachsbracke is called by many names. 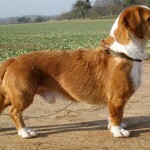 It is called as Basset des Alpes and also as Alpenlandischer Dachsbracke. The breed originated in Austria.